The unique option will be available starting March 25. 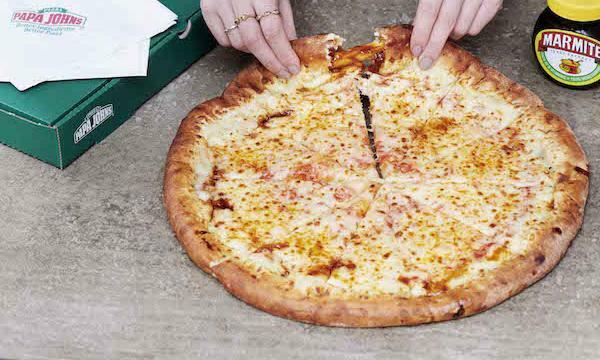 Papa John's once again partnered with Marmite to spread the partnership beyond the pizza chain's side menu and into the crusts of their pizzas. Marmite-stuffed crusts will be available on all Papa John’s existing pizzas nationwide and can be ordered online at www.papajohns.co.uk and in store from 25th March 2019, for a limited time. The two companies previously developed the chain's Marmite Scrolls earlier this year. “Ingredient innovation is at the core of our menu and we’re sure that the addition of Marmite to our cheesy crusts will be a huge hit," Papa John's managing director Liz Williams said.